I definitely have a few favorite furniture project sites at this point. 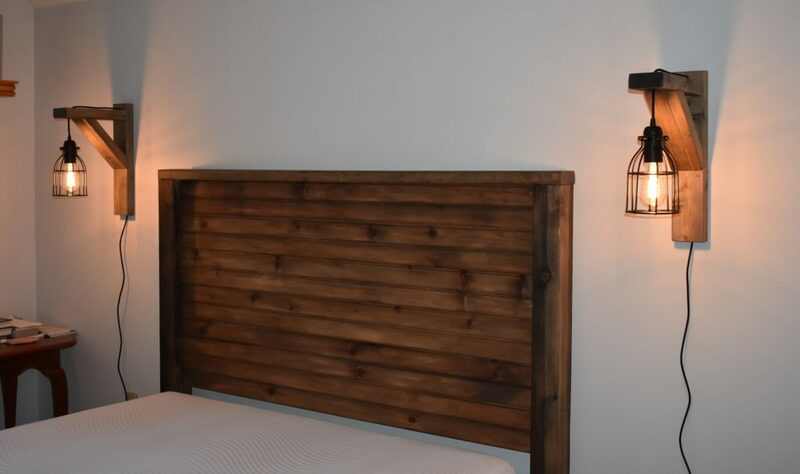 A few months ago, I was scrolling through project ideas and I saw the Corbel Sconce Light by Shanty-2-Chic.Tim and I agreed that these would be a great compliment to the new bed frame. Have I mentioned that WE BUILT A BED?!? I started with leftover 2x4s, ordered the lights and cages online, and found bulbs at Lowes. In order to match the bed, I used the same Weatherwash PINED Aging Stain, Clear Maintenance Oil and Satin Varnish that is on the bed. I really love love love the way the wood looks after using this combination. It’s also pretty darn fast and easy. 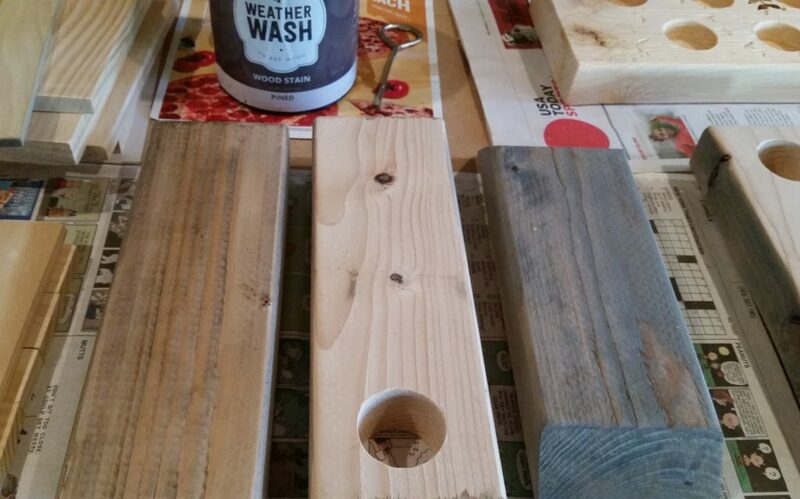 On the left is the wood just after applying the stain, on the right is after drying for an hour. Using Tim’s ideas, we made a few changes. 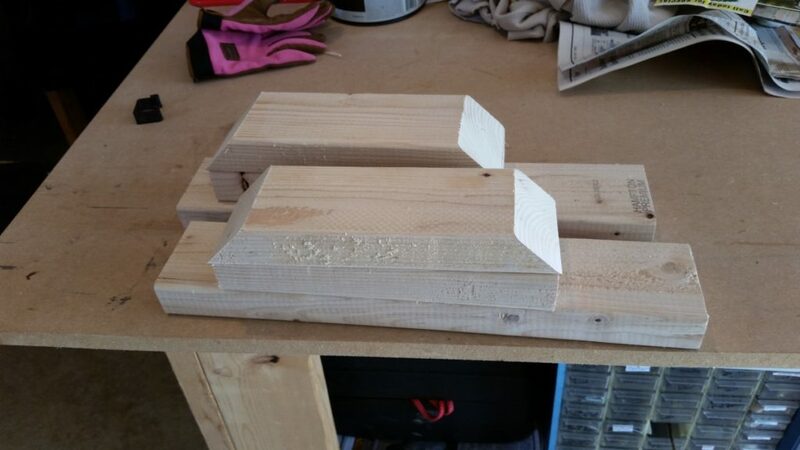 We used a router for the first time and made a (too large but workable) channel in the back of the upright piece. 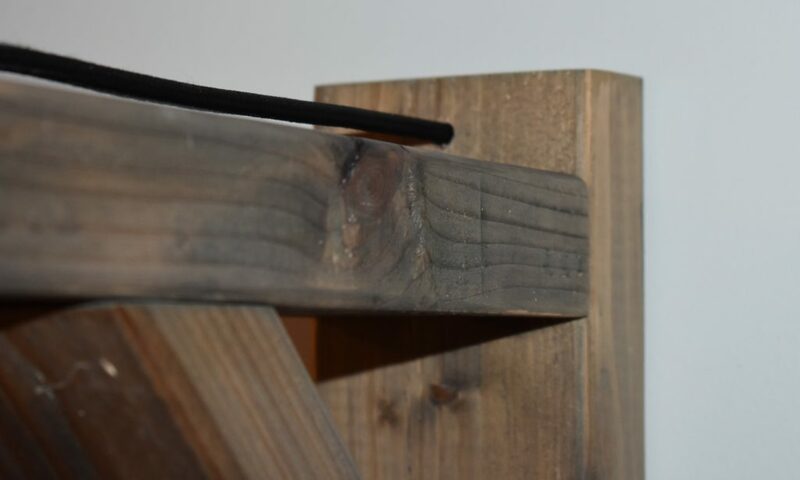 Instead of the cord being in front of that piece, it would go up the back and be less prominent. That led to drilling a hole just on top of the perpendicular piece to bring the cord through, instead of it laying over the top. What we didn’t think of, until assembly, was that Tim had to detach the cord from the light in order to feed it through the hole, then re-attach it. It was worth that extra step. We love how they turned out! The cost estimate from Shanty-2-Chic is $25/each. 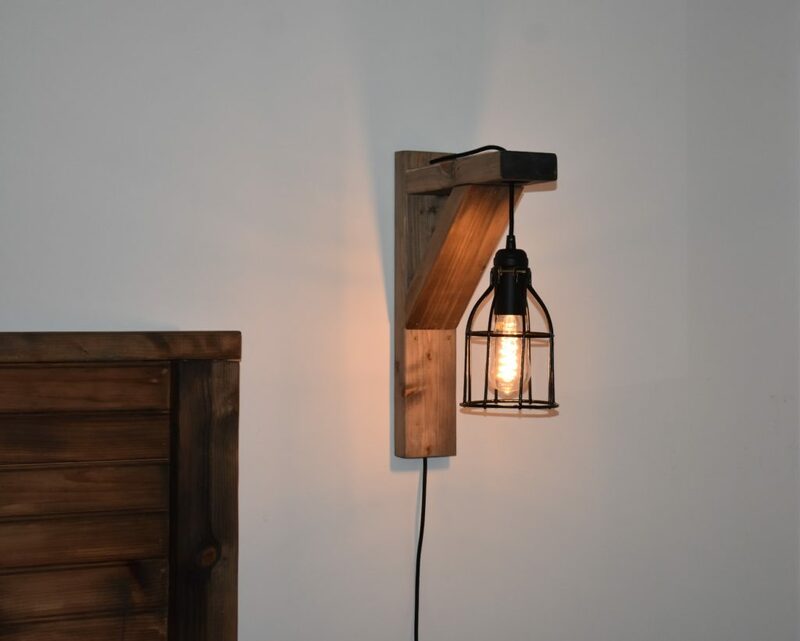 Using leftover pieces of wood helped, but that estimate is a little low depending on the light bulbs you choose. We went with the “vintage” looking bulbs, which were $10/bulb. This raised our total cost to closer to $30. 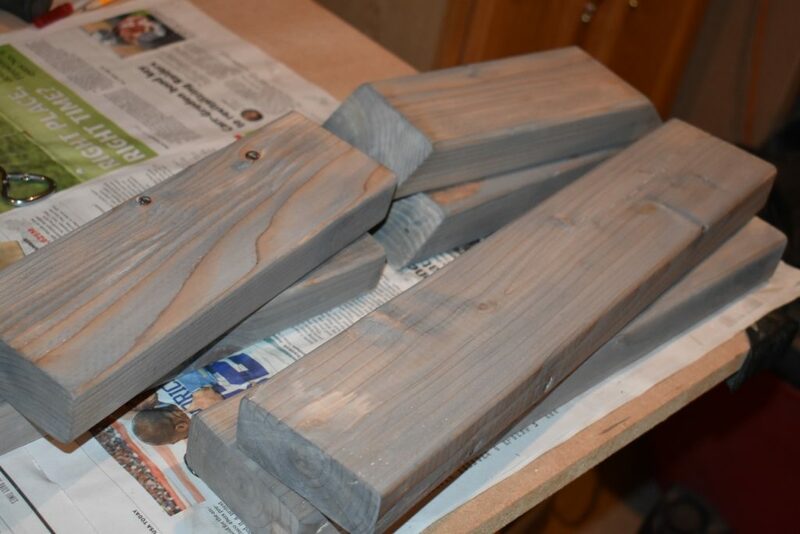 This entry was posted in Empty Nest, Hobby Adventures, House Projects and tagged DIY corbel Sconce Light, empty nest life, hobby adventures, making stuff with wood, Shanty-2-Chic, still needs to be painted, trying something new, updating the bedroom, weatherwash by Mara. Bookmark the permalink. Wow. Those look incredible. 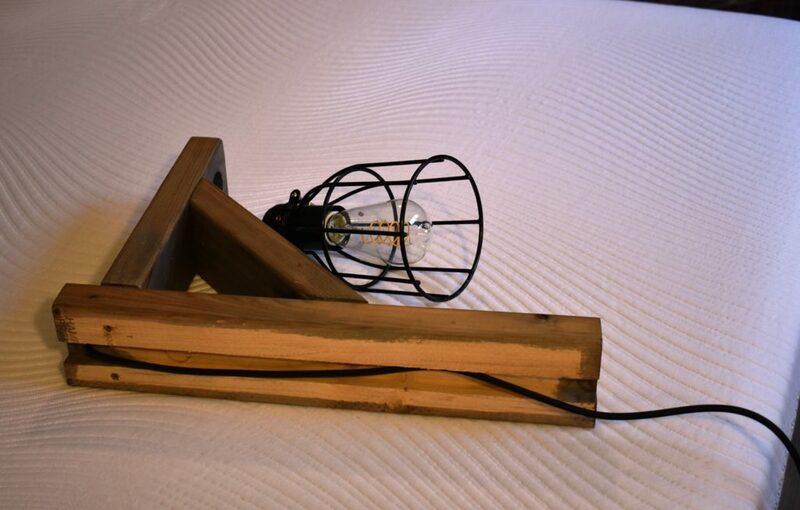 They really finish off the look of the bed frame, and they look perfectly rustic instead of just looking rough. Between you and Tim, you guys can do anything! Really impressive.